Beamish Museum’s Emily Hope is celebrating after being named national VisitEngland Tourism Superstar. Emily, who works at the museum’s Entrance, is thrilled to have won the public vote to claim the prestigious title. She was among 10 finalists and made the shortlist after being crowned Durham Tourism Superstar last year. She follows in the footsteps of Beamish’s Matthew Henderson, who won the national Tourism Superstar award in 2015, and Anthony Gales, who was runner-up in 2013. Emily, Visitor Welcome and Retail (Gift Shop) Team Leader, said: “From the bottom of my heart I just want to say a huge thank you to every person who supported and voted for me in the Tourism Superstar competition. “You’ve got no idea what it means to me to have been crowned VisitEngland national Tourism Superstar, I’m absolutely over the moon! 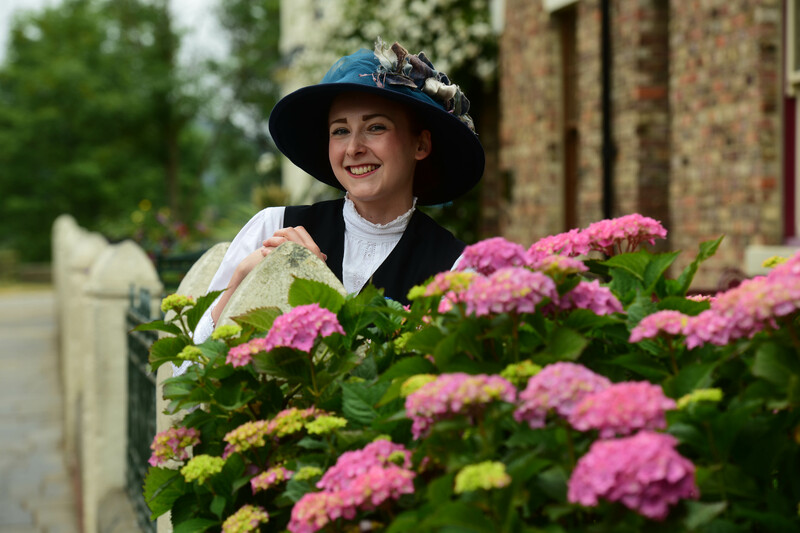 Emily, in her beautiful Edwardian costume, with her beaming smile, greets visitors with the warmest of welcomes and makes sure they have an amazing day out. She is a Dementia Friends Champion who has trained more than 100 of the museum’s Dementia Friends. She is always there to help, being involved in everything from Suffragette marches, shovelling snow and rock and roll dancing to setting up a Dementia Café, directing traffic and carving hundreds of Halloween pumpkins. Rhiannon Hiles, Deputy Director of Beamish Museum, said: “Well, how proud are we of our very own Emily Hope becoming the VisitEngland Tourism Superstar?! “What an accolade for Emily, the museum and County Durham in becoming the nation’s Superstar! Andrew Stokes, VisitEngland Director, said: “The tourism industry depends on great people and this competition is all about recognising and thanking those individuals with their passion whose enthusiasm engages visitors from around the world. People voted for the VisitEngland Tourism Superstar winner, which celebrates those working in the country’s tourism industry, on the Daily Mirror’s website. Runners-up were Ryan Sanders, from Brunel’s SS Great Britain, and Anthony Hurd, from Yorkshire Wildlife Trust’s Living Seas Centre. Michelle Gorman, Managing Director at Visit County Durham, said: “We’d like to extend our huge congratulations to Emily and Beamish Museum. From being named Durham Tourism Superstar in 2018 to now receiving the national accolade, these awards provide an invaluable platform to recognise the people that make Durham such an incredible destination”. Beamish is an award-winning open air museum, bringing to life the history of the North East in the 1820s, 1900s and 1940s. The £18million Remaking Beamish project is currently underway – the biggest expansion in the museum’s history – featuring a 1950s Town, 1950s Farm and expansion of the Georgian Landscape, including a coaching inn where visitors can stay overnight.